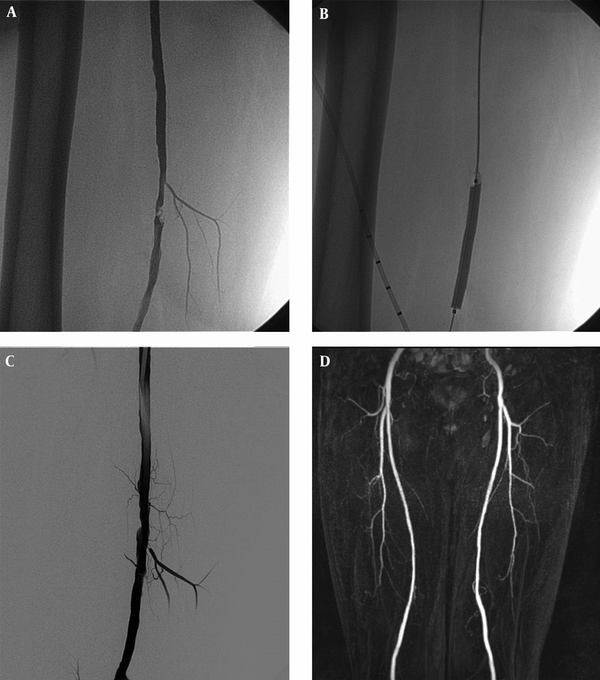 To Cite: Ilker Oz I, Bilici M, Kemal Altinbas N, Bozay Oz E, Caglar E. Endovascular Treatment with Drug-Coated Balloons in Femoropopliteal Artery Disease, Iran J Radiol. 2018 ; 15(1):e61841. doi: 10.5812/iranjradiol.61841. Objectives: In this study, we aimed to evaluate the one-year follow-up findings of endovascular treatment with drug-covered balloon in patients with femoropopliteal artery disease (FAD). Patients and Methods: From June 2012 to March 2015, 43 patients were enrolled in the study. Fifteen patients, 16 limbs and 19 lesions were treated with percutaneous transluminal angioplasty (PTA). Twenty-eight patients, 31 limbs and 36 lesions were treated with drug-coated balloon (DCB). At 12 months, all patients were examined with magnetic resonance angiography. Results: Primary patency was seen in 47.4% of the treated lesions in the PTA group and 80.5% in the DCB group. There was statistically significant difference in primary patency between the groups (P = 0.011). Clinical improvement was seen in 56.3% of the treated limbs in the PTA group and 83.9% in the DCB group. There was no statistically significant difference in clinical improvement between the two groups (P = 0.075). Conclusion: DCB with low restenosis rate can be used safely for endovascular treatment in patients with FAD as an alternative of standard balloon and stent. Percutaneous transluminal angioplasty (PTA) has been considered as the standard treatment of atherosclerotic lesions in the superficial femoral and proximal popliteal arteries (1). PTA has a high initial success rate, but restenosis occurs in up to 60% of cases at long-term follow-up (2). The high restenosis rates are regarded as an important issue that reduces the effectiveness of endovascular treatment in patients with femoropopliteal artery disease (FAD). The vessel wall injury after angioplasty causes the release of adhesion molecules of the platelets. The expression and release of adhesion molecules by platelets leads to the inflammatory process by pulling peripheral circulating leukocytes to the damaged area (3, 4). Smooth muscle cell proliferation and migration from media to intima occurs during vascular development in response to vascular injury that emerged after angioplasty or vascular stent implantation. Extracellular molecules including small biogenic amines, peptide growth factors, cytokines, and extracellular matrix components modulate migration and proliferation of smooth muscle cell that lead to neo-intimal hyperplasia. Infiltration and activation of monocytes in the arterial wall causes negative remodeling, which is described as a process of local contraction of the arterial wall and narrowing of the lumen at the injured vascular segment. Adventitial inflammatory responses and subsequent constrictive fibrosis have been proposed to be the major cause of constrictive negative remodeling after vessel wall injury. The neo-intimal hyperplasia and negative remodeling are considered to be the major causes of restenosis (3, 4). The alternative treatment methods such as drug-eluting stents, atherectomy, laser angioplasty, endovascular brachytherapy, and drug-coated balloon (DCB) have been developed to reduce the restenosis rate by decreasing both neo-intimal hyperplasia and negative remodeling. In the treatment of femoropopliteal artery occlusive disease, it is known that PTA with stent placement has lower long-term restenosis rates than PTA alone (5). Furthermore, the mobility and length of the location of FAD facilitate the development of long stent fractures, restenosis and thrombosis after stent implantation. The most important advantages of DCB versus stents for the treatment of FAD are tied to having more homogeneous and anti-proliferative drug in high doses required per square millimeter, and no foreign substances that might trigger inflammatory processes (6, 7). In many studies, promising reduced restenosis rates in patients with coronary artery disease who were treated with DCB have been reported (8, 9). Despite the improved restenosis rates reported in some trials with DCB versus PTA for the treatment of FAD, there is debate regarding the advantages of clinical outcomes of these techniques (10-15). In this study, we aimed to evaluate the one-year follow-up findings of endovascular treatment with DCB in patients with FAD leading to critical limb ischemia and severe claudication. From June 2012 through March 2015, all consecutive adult patients with critical limb ischemia (CLI) or severe claudication (Rutherford class 3 to 5) related to femoropopliteal disease were revised for enrolment. 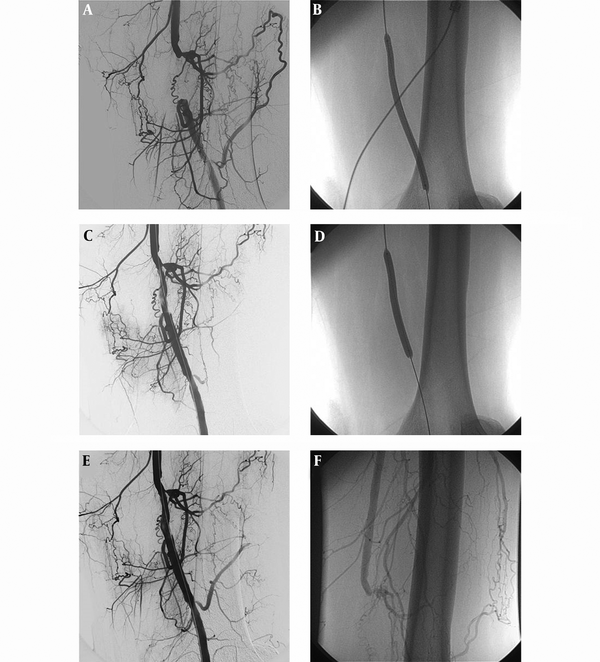 Inclusion criteria were atherosclerotic disease involving the superficial femoral artery and/or the popliteal artery, CLI or severe claudication, endovascular treatment and at least 1-year follow-up. Exclusion criteria were stent placement and less than 1-year follow-up. In total, 56 patients were identified. Thirteen patients were excluded because of stent placement for a residual stenosis of higher than 30% or a flow-limiting dissection despite prolonged dilation. Finally, 43 patients were included in the study. In these patients, 15 patients, 16 limbs and 19 lesions were treated with PTA for all procedures. Also, 28 patients, 31 limbs and 36 lesions were treated with DCB for all procedures. This retrospective single-center study was approved by the institutional ethics committee. All individuals provided written informed consent to participate in the study, and the study was performed without any industrial financial support. The clinical data of all patients treated in our department had been prospectively recorded since 2012, and the patients were identified by a computerized search of this database and the medical records of our hospital. Until September 2013, all consecutive patients with peripheral arterial disease (PAD) were treated with standard balloon PTA. After this date, DCB was used for treatment of PAD. All patients were taking aspirin 100 mg daily. Antiplatelet therapy was not interrupted during the intervention. Post-intervention 100 mg aspirin was given daily thereafter. In diabetic patients receiving metformin treatment, even those who had a glomerular filtration rate (GFR) of ≥ 60 mL/min/1.73 m2, to avoid lactic acidosis, metformin treatment was stopped 48 hours before the intervention and started 48 h after the intervention only if renal function was normal (16). The interventions were performed under local anesthesia using Lidocaine 1%. The site and direction of the arterial access (ante-grade ipsilateral or retro-grade contralateral) were chosen depending on the inflow status. In patients, even those who were obese without the inflow lesion on iliac, common femoral and proximal superficial femoral arteries, ultrasonography (USG)-guided ante-grade ipsilateral access was preferred. For ante-grade and retrograde approach, 6F introducer and 6F 45 cm guiding sheath (destination peripheral guide case, terumo corporation, Tokyo, Japan) were placed respectively. After sheath insertion, 5000 IU heparin was administered. Lesions were crossed with 0.035-inch wire (glidewire advantage guidewire, terumo corporation, Tokyo, Japan) and 4F hydrophilic catheter (glidecath hydrophilic coated catheter, terumo corporation, Tokyo, Japan) or a total occlusion catheter (navicross support catheter, terumo corporation, Tokyo, Japan). Standard techniques were used for DCB (Luminor 35 Paclitaxel-eluting peripherial dilatation balloon catheters, IVascular S.L.U, Barcelona, Spain) (Figures 1 and 2). DCB is coated with paclitaxel (3 mg/mm2 balloon surface) in a crystalline structure, which is incorporated in a carrier matrix of water-reduced ester. Drug/excipient ratio is 80/20. DCB has a proprietary transfertech coating technology that is engineered to improve clinical efficacy by optimizing coating properties. In an animal study, this DCB platform had promising results compared to conventional balloon with significantly reduced in-stent restenosis (17). Inflation time was at least 3 minutes for both groups. In the event of flow-limiting dissection or residual stenosis (> 30%), a prolonged dilation of at least 3 minutes was performed (Figure 3). The stents were placed owing to either significant residual stenosis or flow-limiting dissection after prolonged dilation. Figure 1. Angiogram of a 57-year-old male patient showing critical stenosis of the left superficial femoral artery (A). Result of drug-coated balloon (DCB) angioplasty showing a satisfactory angiographic result at the end of the procedure (B and C). On magnetic resonance angiography (MRA), primary patency confirmed up to 12 months after angioplasty (D). Figure 2. Angiogram of a 58-year-old male patient showing critical stenosis of the right superficial femoral artery (A). Result of drug-coated balloon (DCB) angioplasty showing a satisfactory angiographic result at the end of the procedure (B and C). In the sixteenth month after the procedure, primary patency is confirmed on magnetic resonance angiography (MRA) (D). Figure 3. Angiogram of a 43-year-old male patient showing total occlusion of the left superficial femoral artery (A). Result of DCB angioplasty showing a flow-limiting dissection at the end of the procedure (B and C). After prolonged dilation (C), a satisfactory angiographic result is seen (D and E). In the second month after the procedure, angiography was performed due to clinical worsening. It shows total occlusion of target lesion (F). After intervention, the patients were seen in the first week and every three months in our outpatient clinic. All patients were also followed up in a multidisciplinary outpatient diabetes clinic to regulate blood glucose and facilitate the wound healing process. A single operator using doppler ultrasonography (DUS) examined the patients who had not undergone a major amputation at 3 and 6 months visits. Peak systolic velocity (PSV) in the target vessel was determined and compared with that in the preceding normal segment. A focal increase of at least 140% in the PSV (corresponding to a peak velocity ratio of > 2.4) was considered indicative of binary stenosis (≥ 50% re-stenosis) (18). At 12 months visit, all patients were examined with magnetic resonance angiography. In the event of recurrence of clinical CLI, angiography and repeated revascularization were performed within 1 week and these patients were accepted as clinical deterioration. Primary patency was defined as absence of target lesion revascularization (TLR) and binary restenosis (BS) assessed by DUS and magnetic resonance angiography (MRA). Major amputation is defined as amputation above the ankle. Binary stenosis is defined as recurrence of ≥ 50% diameter stenosis within ± 5 mm proximal and/or distal to the target lesion as measured by DUS or angiography. TLR is defined as a re-intervention performed for ≥ 50% diameter stenosis of target lesion that confirmed by angiography after an increase in size of a pre-existing wound(s) and/or occurrence of a new wound(s), and/or deterioration in Rutherford class. Clinical improvement was defined as decreases of at least 1 Rutherford classes after intervention. Major amputations, no change or an increase in the Rutherford classification were considered as clinical deterioration. Statistical analyses were performed using SPSS software (ver. 19.0 for Windows; SPSS Inc., Chicago, IL, USA). Descriptive statistics of continuous variables are given with mean and standard deviation or with median, minimum and maximum values; qualitative variables are given with frequency and percent. Shapiro Wilk test was used for test of normality. Independent samples t test was used for two group comparisons of normal distributed variables. For non-normal distributed variables Mann Whitney U test for two-group and Kruskal Wallis test were used for three and above (3+) group comparisons. Yates corrected and Fisher exact Chi-Square tests were used for two group comparisons of binary variables. Kaplan-Meier curves (log-rank test) were used to compare clinical improvement and primary patency between the two study groups. All statistical comparisons with a p value below 0.05 were assumed as statistically significant. Baseline characteristics of patients are described in Table 1. There was no statistically significant difference between groups in terms of age, gender, characteristics of lesions, and risk factors (P > 0.05). Abbreviations: CAD, Coronary arterial disease; DCB, Drug-coated balloon; PA, Popliteal artery; PTA, Percutaneous transluminal angioplasty; SFA, Superficial femoral artery. aPTA and DCB groups were compared for Rutherford class (class 4 + 5). Clinical and imaging results of 12 months follow-up are given in Table 2. Major amputation was not performed during the follow-up period. Clinical improvement was seen in 56.3% of the treated limbs in the PTA group and in 83.9% in the DCB group. There was no statistically significant difference in clinical improvement between the two groups (P = 0.075). Freedom from clinical deterioration through 12 months was higher in the DCB group versus the PTA group (log-rank P = 0.027) (Figure 4). Abbreviations: BS, Binary stenosis; DCB, Drug-coated balloon; PTA, Percutaneous transluminal angioplasty; TLR, Target lesion revascularization. aPTA and DCB groups were compared for vessel patency (BS + TLR). Primary patency was seen in 47.4% of the treated lesions in the PTA group and 80.5% in the DCB group. There was statistically significant difference in primary patency between the groups (P = 0.011). Freedom from BS and TLR through 12 months was higher in DCB group versus PTA group (log-rank P = 0.009 and 0.041, respectively) (Figure 5). Figure 5. Kaplan-Meier estimations of freedom from binary restenosis (BS) and target lesion revascularization (TLR) (Log-Rank P = 0.009 and P = 0.041 Respectively). In agreement with previous reports, the results of this single center retrospective study indicate that DCB had a higher primary patency rate than PTA (2, 10-13, 15). However, there was no statistically significant superiority of DCB over PTA regarding clinical improvements. There is also a debate regarding whether DCB or PTA is more impressive in clinical improvement. In femoral paclitaxel (FemPac) trial, Werk et al. reported that DCB had less binary restenosis, target lesion revascularization, and better clinical results at the first 6 months after the procedure (10). 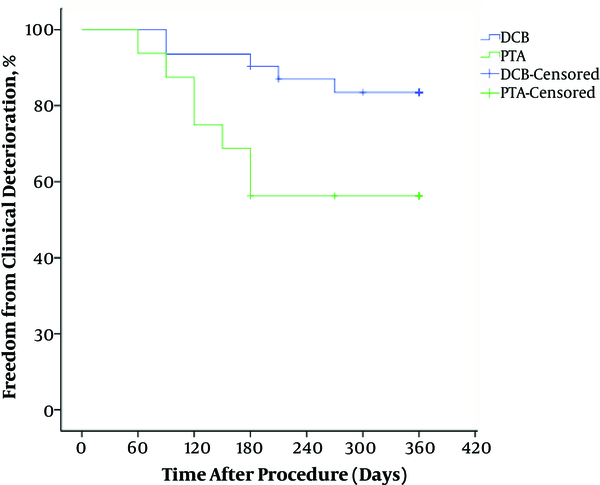 At the same time, this study stated that DCB did not have any advantage at 24-months follow-up regarding primary patency, binary restenosis, and clinical improvement. In THUNDER trial concomitantly performed with FemPAC, DCB had a significant superiority to PTA regarding late lumen loss, and target lesion revascularization at 6 months; however, there was no significant difference between the groups in clinical improvement (11). PACIFIER, DEBELLUM, and LEVANT 1 trials have similar results to the previous studies (12-14). In the IN.PACT DEEP randomized trial by Zeller et al., no significant difference was found between DCB and PTA at 12-month follow-up regarding death, major amputation or clinically driven TLR. Moreover, primary safety results that were the composite of all-cause death, major amputation, and clinical driven-TLR through six months were 17.7% in DCB and 15.8% in PTA. In the IN.PACT DEEP trail, primary and secondary efficacy results at 12-month follow-up showed no differences and in binary restenosis, the rates were 41.0% in DCB and 35.5% in PTA. In a comparative study of 476 patients with CLI (LEVANT 2), Rosenfield et al. reported significantly lower 12-month restenosis rates of 52% versus 65.2% in DCB compared to PTA. However, any significant difference between DCB and PTA regarding major amputation, or TLR has not been found despite lower restenosis rate for DCB (2). In this trial, only the improvement in the score for the walking-distance component of the Walking Impairment Questionnaire reported as a significant difference among groups. In the IN.PACT SFA randomized trial with 331 patients, both primary patency and TLR has been reported between DCB and PTA at 12-month follow-up (15). Tepe et al. also found a significantly higher primary sustained clinical improvement in DCB in comparison with PTA. Paclitaxel is the most often used anti-proliferative agent that halts the cell cycle in the mitotic phase. Lipophilic property of paclitaxel facilitates tissue uptake and prevents the washing of the drug from the vessel’s adventitia. This feature provides a prolonged antiproliferative effect. Low dose (3 mg / mm2) paclitaxel with one application inhibits smooth muscle proliferation in the vessel wall (17). There are several factors that affect the effectiveness of paclitaxel on the vascular wall such as the carrier used on the balloon, characteristics of the lesion, and diabetes mellitus (DM). Carriers are substances that are used to keep the drug on the surface of the balloon and to deliver it in a controlled way to the vascular wall. Carriers, mostly hydrophilic structures, try to minimize the loss of the hydrophobic paclitaxel microparticles in the systemic circulation (19). The inflation time is as important as the efficacy of the carrier to reach therapeutic levels of paclitaxel in the target lesion (20). SFA lesions are usually presented with heavy calcification and total occlusion. The heavy calcification on the target lesion may reduce drug delivery to the vessel wall via DCB (7). Sub-intimal angioplasty in total occlusion and long lesions also reduces the effectiveness of DCB. We believe that the most important factor affecting clinical results and TLR is DM. Alterations in DM affect both multiple cell types within the vascular wall and platelet aggregation (21). Diabetic patients have elevated levels of C-reactive protein and generalized endothelial dysfunction. DM also stimulates atherogenic pathways in vascular smooth muscle cells. So, diabetic patients have more extensive and diffuse atherosclerotic lesion. Additionally, atheroma plaques in diabetic patients have fewer smooth muscle cells than non-diabetic patients (22). This might be an important handicap of paclitaxel coated balloon in diabetic patients. Our study has a number of limitations. The first limitation is that we enrolled a small number of patients from a single center, which could lead to selection bias. In order to minimize this selection bias, we tried to include all patients who met the inclusion criteria. As most trials had included severe claudicates in their populations, we also included these patients. We had few patients in the classification Rutherford 5 and 6. In Conclusion DCB with a low restenosis rate can be used safely for the endovascular treatment in FAD as an alternative of standard balloon. There is a need for studies to evaluate the effectiveness of DCB along with extended inflation durations. For now, DCBs add cost to the basic endovascular procedure; as a result their added cost needs to be justified. 1. Jaff MR, White CJ, Hiatt WR, Fowkes GR, Dormandy J, Razavi M, et al. An update on methods for revascularization and expansion of the TASC lesion classification to include below-the-knee arteries: A supplement to the inter-society consensus for the management of peripheral arterial disease (TASC II): The TASC steering committee. Catheter Cardiovasc Interv. 2015;86(4):611-25. doi: 10.1002/ccd.26122. [PubMed: 26256456]. 2. Rosenfield K, Jaff MR, White CJ, Rocha-Singh K, Mena-Hurtado C, Metzger DC, et al. Trial of a Paclitaxel-Coated Balloon for Femoropopliteal Artery Disease. N Engl J Med. 2015;373(2):145-53. doi: 10.1056/NEJMoa1406235. [PubMed: 26106946]. 3. Pentecost MJ, Criqui MH, Dorros G, Goldstone J, Johnston KW, Martin EC, et al. Guidelines for peripheral percutaneous transluminal angioplasty of the abdominal aorta and lower extremity vessels. A statement for health professionals from a Special Writing Group of the Councils on Cardiovascular Radiology, Arteriosclerosis, Cardio-Thoracic and Vascular Surgery, Clinical Cardiology, and Epidemiology and Prevention, the American Heart Association. J Vasc Interv Radiol. 2003;14(9 Pt 2):S495-515. [PubMed: 14514865]. 4. Tsetis D, Uberoi R. Quality improvement guidelines for endovascular treatment of iliac artery occlusive disease. Cardiovasc Intervent Radiol. 2008;31(2):238-45. doi: 10.1007/s00270-007-9095-5. [PubMed: 18034277]. 5. Thukkani AK, Kinlay S. Endovascular intervention for peripheral artery disease. Circ Res. 2015;116(9):1599-613. doi: 10.1161/CIRCRESAHA.116.303503. [PubMed: 25908731]. 6. Franzone A, Stabile E, Trimarco B, Esposito G. Peripheral drug-eluting technology. Cardiol Clin. 2015;33(1):151-62. doi: 10.1016/j.ccl.2014.09.005. [PubMed: 25439337]. 7. Banerjee S, Sarode K, Mohammad A, Brilakis ES. 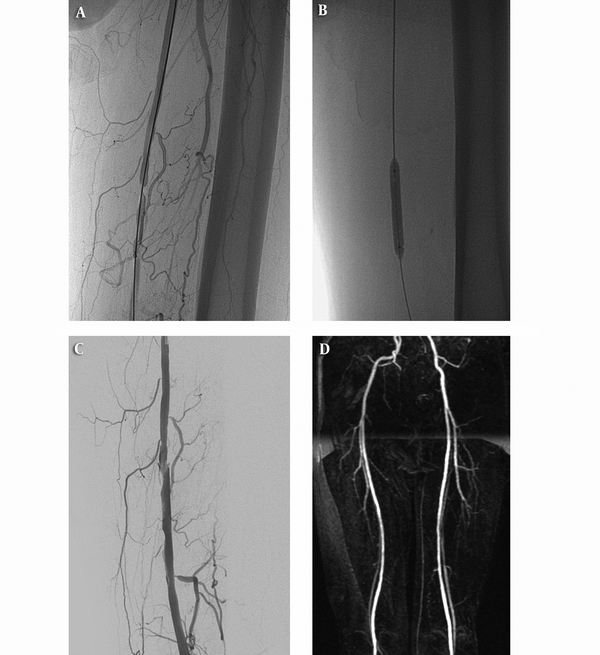 Drug-coated balloon and stent therapies for endovascular treatment of atherosclerotic superficial femoral artery disease. Curr Cardiol Rep. 2015;17(5):36. doi: 10.1007/s11886-015-0586-8. [PubMed: 25894799]. 8. Siontis GC, Stefanini GG, Mavridis D, Siontis KC, Alfonso F, Perez-Vizcayno MJ, et al. Percutaneous coronary interventional strategies for treatment of in-stent restenosis: a network meta-analysis. Lancet. 2015;386(9994):655-64. doi: 10.1016/S0140-6736(15)60657-2. [PubMed: 26334160]. 9. Kleber FX, Rittger H, Bonaventura K, Zeymer U, Wohrle J, Jeger R, et al. Drug-coated balloons for treatment of coronary artery disease: updated recommendations from a consensus group. Clin Res Cardiol. 2013;102(11):785-97. doi: 10.1007/s00392-013-0609-7. [PubMed: 23982467]. 10. Werk M, Langner S, Reinkensmeier B, Boettcher HF, Tepe G, Dietz U, et al. Inhibition of restenosis in femoropopliteal arteries: paclitaxel-coated versus uncoated balloon: femoral paclitaxel randomized pilot trial. Circulation. 2008;118(13):1358-65. doi: 10.1161/CIRCULATIONAHA.107.735985. [PubMed: 18779447]. 11. Tepe G, Zeller T, Albrecht T, Heller S, Schwarzwalder U, Beregi JP, et al. Local delivery of paclitaxel to inhibit restenosis during angioplasty of the leg. N Engl J Med. 2008;358(7):689-99. doi: 10.1056/NEJMoa0706356. [PubMed: 18272892]. 12. Werk M, Albrecht T, Meyer DR, Ahmed MN, Behne A, Dietz U, et al. Paclitaxel-coated balloons reduce restenosis after femoro-popliteal angioplasty: evidence from the randomized PACIFIER trial. Circ Cardiovasc Interv. 2012;5(6):831-40. doi: 10.1161/CIRCINTERVENTIONS.112.971630. [PubMed: 23192918]. 13. Fanelli F, Cannavale A, Boatta E, Corona M, Lucatelli P, Wlderk A, et al. Lower limb multilevel treatment with drug-eluting balloons: 6-month results from the DEBELLUM randomized trial. J Endovasc Ther. 2012;19(5):571-80. doi: 10.1583/JEVT-12-3926MR.1. [PubMed: 23046320]. 14. Scheinert D, Duda S, Zeller T, Krankenberg H, Ricke J, Bosiers M, et al. The LEVANT I (Lutonix paclitaxel-coated balloon for the prevention of femoropopliteal restenosis) trial for femoropopliteal revascularization: first-in-human randomized trial of low-dose drug-coated balloon versus uncoated balloon angioplasty. JACC Cardiovasc Interv. 2014;7(1):10-9. doi: 10.1016/j.jcin.2013.05.022. [PubMed: 24456716]. 15. Tepe G, Laird J, Schneider P, Brodmann M, Krishnan P, Micari A, et al. Drug-coated balloon versus standard percutaneous transluminal angioplasty for the treatment of superficial femoral and popliteal peripheral artery disease: 12-month results from the IN.PACT SFA randomized trial. Circulation. 2015;131(5):495-502. doi: 10.1161/CIRCULATIONAHA.114.011004. [PubMed: 25472980]. 16. van Overhagen H, Spiliopoulos S, Tsetis D. Below-the-knee interventions. Cardiovasc Intervent Radiol. 2013;36(2):302-11. doi: 10.1007/s00270-013-0550-1. [PubMed: 23354963]. 17. Perez de Prado A, Perez-Martinez C, Cuellas Ramon C, Regueiro Purrinos M, Diego Nieto A, Gonzalo-Orden JM, et al. Safety and efficacy of different paclitaxel-eluting balloons in a porcine model. Rev Esp Cardiol (Engl Ed). 2014;67(6):456-62. doi: 10.1016/j.rec.2013.09.030. [PubMed: 24863594]. 18. Ferraresi R, Centola M, Ferlini M, Da Ros R, Caravaggi C, Assaloni R, et al. Long-term outcomes after angioplasty of isolated, below-the-knee arteries in diabetic patients with critical limb ischaemia. Eur J Vasc Endovasc Surg. 2009;37(3):336-42. doi: 10.1016/j.ejvs.2008.12.001. [PubMed: 19112033]. 19. Katsanos K, Spiliopoulos S, Paraskevopoulos I, Diamantopoulos A, Karnabatidis D. Systematic Review and Meta-analysis of Randomized Controlled Trials of Paclitaxel-Coated Balloon Angioplasty in the Femoropopliteal Arteries: Role of Paclitaxel Dose and Bioavailability. J Endovasc Ther. 2016;23(2):356-70. doi: 10.1177/1526602815626557. [PubMed: 26823485]. 20. Heilmann T, Richter C, Noack H, Post S, Mahnkopf D, Mittag A, et al. Drug release profiles of different drug-coated balloon platforms. Eur Cardiol. 2010;6(4):40-4. 21. Marso SP, Hiatt WR. Peripheral arterial disease in patients with diabetes. J Am Coll Cardiol. 2006;47(5):921-9. doi: 10.1016/j.jacc.2005.09.065. [PubMed: 16516072]. 22. Fukumoto H, Naito Z, Asano G, Aramaki T. Immunohistochemical and morphometric evaluations of coronary atherosclerotic plaques associated with myocardial infarction and diabetes mellitus. J Atheroscler Thromb. 1998;5(1):29-35. [PubMed: 10077455].